There is still far too long to go until the Australian GP opens the season. I do not think that I am the only one who has found the break interminably long this time - it feels at least twice as long as last year's. That may be the result of our expectation that the competition will be extremely close this time, our desire to put the political events of 2007 firmly in the past or, from the F1 blogger's point of view at least, the dearth of really interesting off season news with which to create new posts. It might even be a combination of all of these. The result is that we have fingered the season until it has become dog-eared. We have endlessly predicted the outcome of both championships, resorted to gossip about the most flimsy and unlikely rumors, torn Max and Bernie to pieces several times over, and yet nothing really satisfies our craving. We are addicts indeed. It was interesting, however, to see the amount of comment generated by my last post regarding KERS. Even more so than with predictions or driver assessments, technical matters seem to elicit a wide range of opinions, many of which are quite passionately held. This interest in the minutiae of the sport is fairly exceptional, I think - how many football fans do you know who could pontificate upon the flight characteristics of the ball or the composition of the goal net? My obvious conclusion is that I should be writing more technical posts to meet this demand. The problem is that I am no techie. What understanding I have of the engineering behind F1 cars comes entirely from my own investigation of matters that happen to interest me. For instance, I was looking at aerodynamics in the sixties, long before the actual engineers began to use them in any significant way. But, if you had asked me about suspension design at the time, I would have had only a few remembered words (wishbones, de Dion) with which to hide my ignorance. As Steven Roy put so eloquently in a comment today, however, our lack of any qualification to expound upon technical matters actually frees us to ignore the realities that hold the genuine experts so much closer to earth. And there is another factor that allows us to see further than the professionals on rare occasions - our greater understanding of matters totally unconnected with engineering can give us a better overall picture and may even open doors to fresh ways of viewing a problem. A couple of years ago, on my personal blog, I wrote about a few of the wild ideas of my youth in a post entitled Inventions of a non-Engineer. Most of those inventions have turned out to be already existent but that does not discourage me - it merely proves that I was right, if not the first! And there are still a few ideas from those years that I have yet to see used in reality. My point is that F1 enthusiasts will always want to know why the engineers are doing certain things to the cars and that we should not be too hesitant to debate the arcane sciences of aerodynamics, energy saving, safety systems or any of the myriad aspects involved in the creation of a F1 car. The experts may smile at the limitations of our knowledge but there will be occasions when we have the last laugh. As an instance, I feel that the modern concern for and concentration on the diffuser is exaggerated. Teams go to extraordinary lengths to hide what they are doing with their diffuser each year, some distributing no photos of the rear of the car and Williams putting it in a box this time around. 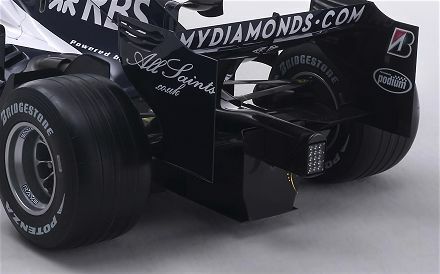 I think I know how the diffuser works but I am not sure, so I will not go into the reasons why I think it enjoys far too much hype; let me say only that the areas around the diffuser are just as important in creating downforce and should not be despised. Of course, the engineers have access to wind tunnels and computers so they ought to know what they are talking about. My objections are inevitably theoretical and have little acquaintance with reality - yet they may still be proved correct one day. And all of this is a very long-winded way of promising that I will try to do more technical posts in the future. At times the extent of my ignorance will become apparent but at least we can all learn from the experience and become more aware of exactly what is happening when a F1 car takes to the track. It's all part of the sport and ours to play with therefore. I think Williams have built a huge gearbox to guarantee reliability and are just too embarrassed to show it. I was about to post this and then my brain rumbled into gear. When Lotus first put venturi tunnels under an F1 car to create ground effect Chapman convinced everyone the car was fast because it had a trick gearbox. As soon as the car arrived in he pits the mechanics covered the gearbox. people were so keen to find out what kind of gearbox Chapman had come up with they missed the fact that there were two huge tunnels under the car and brush skirts down its sides. At Ferrari's launch they didn't show any pictures of the rear leading to all sorts of reasons why. Maybe Williams have something clever behind that box but maybe the box is there to divert our antention from something else. They are shrewd people at Williams. You may not be an engineer, Clive, but I'm sure you've got a better handle on much of F1 than most of us, so lead on, and we'll chime in. Ah, Steven, then Williams would be doing exactly what I jokingly suggested BMW were up to with their towers on the nose last year - diverting attention from the real innovation! I love the idea and hope it's true. It would be even more reason to wish Williams on to another long-awaited championship. Thanks, Arnet - I'll do my best! I only had one comment about the KERS because I really did not want to show my engineering ignorance. I read every one and thought that Steven must be an engineer. I mean I read the same article last year from Perdue U and I never would have been able to do the calculations. Having a small amount of knowledge about the aero package and the actual engineering in the car does not minimize the fact that I am pretty good working in the engine compartment. I tend to know how to make it go fast but the chassis is like an animal that I can not get my hands around. I enjoyed the comments from the last post but please have just as many non-techi posts Clive. When we talk engines I will comment. I agree that we have beaten all the possible subjects to death this off-season. I can not wait for the season to begin. I have also not posted any of my preseason predictions on any post or web site. This could be an idea for you Clive. This way all our predictions are on one site and we can live or die by them during the season!! I think my guest writer, Andy, may be coming up with something on the predictions line, John, and I don't want to pre-empt him. Also, I've written a post for F1 Fanatic that includes some of my wild predictions and that should be going up soon. But it's a good idea to have some sort of "place your bets here" post - I'll have a think about it. As for predictions, I've never been one for them myself. I'm always wrong, you see. Or I just 'predict' what I want to happen. As for football fans and their minutiae I'm not sure that's an entirely fair comparison. I am a football fan and couldn't give a fig about the net. The ball is spoken about in some circles (it's been getting lighter every year - it should be able to FLOAT by now!) but the detail is in the tactics that the casual observer does not see. Similarly, as a motorsport fan, I don't often consider the break-down of components of the tarmac other than some tracks wear tyres faster than others in some conditions. We don't ask WHY (or I don't) we just accept they do. Marvellous reading, but there's a pub calling.... Only one week to go. My combustion engine appetite will be sated this weekend by the return of MotoGP on Sunday evening. I suspect that we all make predictions in that way, DBT, pushing our favorite teams to the front and being mean to the rest. The trick in getting things right is probably in ignoring personal preference but it's not easy to do. Engines are interesting, I agree, and I do happen to know why everyone went for a V10 under the previous formula. Perhaps I'll do a post on that in the near future.